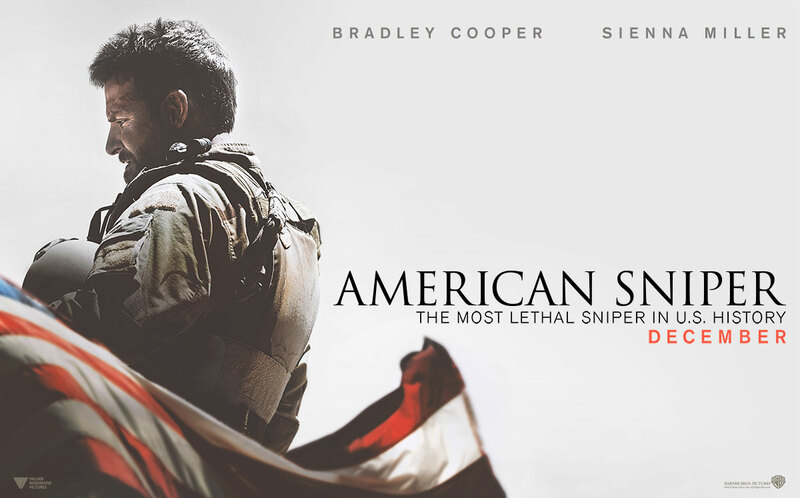 French director Francois Truffaut once quipped “There’s no such thing as an anti-war movie”, and after seeing American Sniper you’d be inclined to agree. Clint Eastwood’s latest film is an absurd contradiction as it excessively glorifies war while still reminding us that the whole notion is maddeningly pointless and filled with loss. Despite the confused message, the film is a compelling rush of adrenaline and tension that negates much of film’s flaws. In a modern incarnation of his Oscar winning film Unforgiven, Eastwood once again picks apart the idea of legends and myths via Kyle’s reluctant rise to prominence. As Kyle’s deadly proficiency brings him heroic status from his comrades, gifting him the wonderfully unimaginative nickname ‘Legend’, it takes a contrasting toll on him and his personal life. In one of the film’s most agonisingly tense moments we’re shown the pressurised, cut throat nature of Kyle’s job as young boy falls into his crosshairs. Does he shoot this potentially dangerous boy, or let him go and run the risk of him blowing up his fellow troops? These episodes feel like they have weight and consequence behind them instead of being obligatory flashes of violence. The measured, crystal clear framing of the boy from Kyle’s vantage point puts the emphasis on the loneliness of Kyle’s world, only he can make these life or death decisions, and only he can feel the full force of them. Tom Stern, Eastwood’s long-time cinematographer, gives the film a trademark piercing crispness that makes the suspense led action all the more graphic, jolting and thrilling. Additionally, the muted colour scheme of greys and browns reflects Kyle’s own jaded state as the horrors of war literally take the colour out of the world. Back on the home front the drama simmers rather than explodes into action. The usually underwhelming Sienna Miller is excellent, and unrecognisable, as Kyle’s stricken wife Taya. The chemistry between her and Cooper is entirely believable as the film builds up their relationships from its inception in a drunken bar. These early scenes depicting the couple’s rosier days are much more convincing than the later turbulent times which never escalate into anything memorable, especially in contrast to the pulsating sequences in Iraq. One scene between the fractured Taya and Kyle is reduced to a laughable mess due to the bizarre decision to use a ludicrously unrealistic doll rather than a real baby. Of course, the one constant in the venturing between America and Iraq is Kyle. Bradley Cooper bulks out and shaves is overt handsomeness in favour of a more rugged normality that reduces him to the everyday American man. It’s a very natural performance that lingers under the surface for the most part, often physically hiding the strain behind sunglasses. The subtlety is a welcome change from the predictable, melodramatic breakdown we’ve come to expect from men in such predicaments. Cooper’s implosive portrayal is an apt representation of how men bottle up their emotions, never more so than in the intimidatingly masculine and muscular setting of the army. For the most part American Sniper is a grim, harrowing look at the cost of war. We see Kyle fall into a mental malaise brought on by post-traumatic stress, his friends dying and despising war, his wife and children drifting away from him, as well as innocent children slaughtered in the name of honour. War is hell. Everything points to war as an entirely futile exercise that’s been dressed up in false promises of glory, honour and legendary status for men. In the film’s pulsating final third this anti-war message is blown away spectacularly. The climactic battle is like watching a chaotic round of multiplayer on Call of Duty which reduces American Sniper’s depiction of war to a glorified game. The murky lines of good and bad are made abundantly clear as waves of Iraqi troops are gunned down like faceless baddies that deserve all they get. It seems Eastwood can’t help but embellish the myth of war as exciting, even fun at times. Furthermore, Kyle is quick to recover from his bout of PTS and finds solace in helping injured veterans, rather skipping over the fact that war put these men in the damaged suits they’re now forced to wear. At one point we’re faced with Kyle playfully pointing his pistol at his wife while his children play a shoot em’up on the TV, an absurd scene in the context of the brutality served up by guns in the film. This disappointing change of tone supports the likes of Seth Rogan and Michael Moore who derided the film as a blatant piece of pro war American propaganda. The film’s credits are adorned with real footage of marines’ funerals; thousands line the street in a pious celebration of patriotism not a million miles away from Nazi nationalism. For all the negatives of war surrounding Kyle, and the fact he killed 255 men, women and children, we’re ultimately told to applaud this man as a hero. Once you look beyond this nauseating bout of patriotism, the film, for the most part, merely portrays an ideological standpoint. 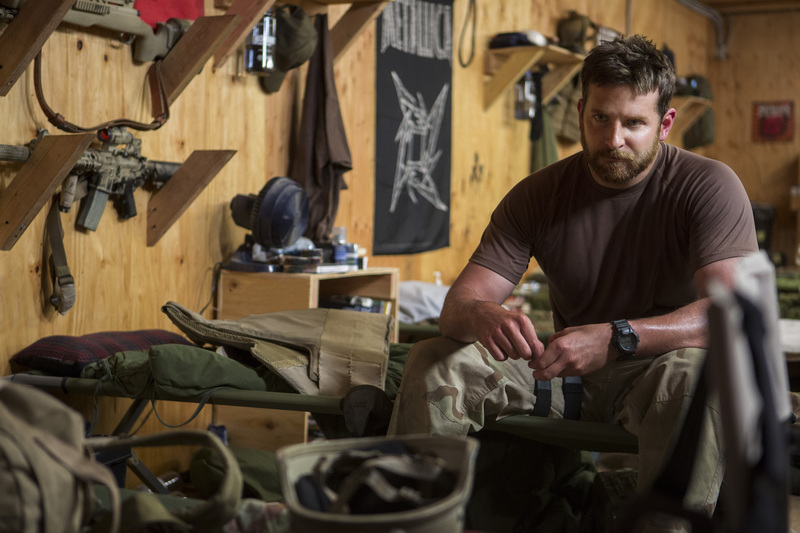 American Sniper is a snapshot of the American way. Kyle himself is more myth than man. He’s a living, breathing caricature as he struts round in a cowboy hat, wins the rodeo, and of course, loves his country. Perhaps the most telling moment in the film is when, as a child, Kyle is lectured by his father to be the “sheep dog” who saves the “sheep” from the big bad “wolves”. Rather than applaud and promote American exceptionalism, you could argue American Sniper is slyly deriding the naïve bravado that brings men like Kyle to war on false pretences, but knowing Eastwood, a man whose legacy has been forged in the sand’s the Western myth, you’d be hard pushed to argue that was his intention all along. American Sniper is an excellent war film with a fine balance between an involving personal tale and pulsating action in abundance. Where Eastwood crumbles, is in his inability to use the evidence he’s made for, himself condemning war, to find the obvious anti-war statement required. Instead Eastwood falls into line with American patriotism by glorifying Kyle as a martyr for his country rather than an individual shattered by delusions of grandeur in battle. 8/10- War! Huh! Yeah! What is it good for? Making films of course.